Create beautiful music on your phone or tablet. 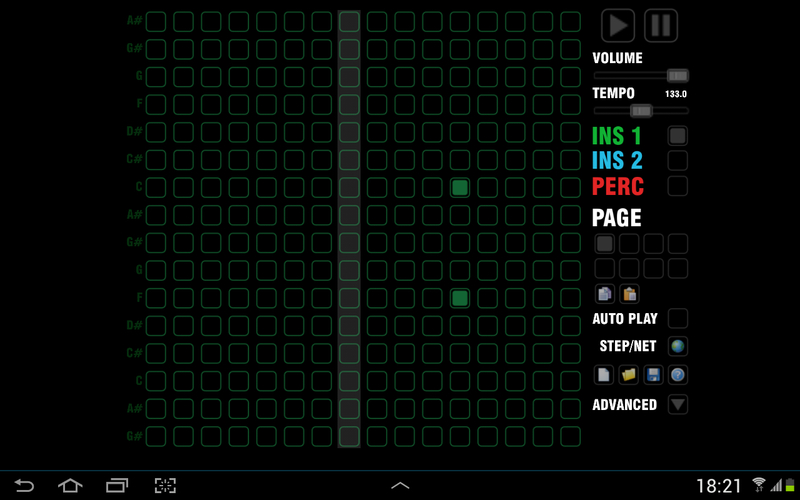 With the sequencer can compose music and you’ll be proud to call their own work, and all with no musical experience! All you need is to press a finger to create an entire composition, which can be saved on our cloud service Step / Net. Sequencer is simple and affordable, as well as the results of their creations will surprise you and your friends. Even if you have never worked with music software or have never considered myself a musician … Now it’s time to prove yourself and create something great! Various tools lead, percussion, etc. Now you can share your creations online with Step / Net! Integrated cloud sharing system. Share your songs with one click. Choose a variety of tools (INS) and percussion (PERC) on the right side. Additional options, where FX / Key / Scale and tone can be changed. Just play with it and you will see that it is very easy to use, once you learn how to use it.